Counter-depth refrigerators, which have cabinets that stand flush with the edge of kitchen cabinets and counters, offer the sleek look of a built-in fridge for far less money. However, they're still more expensive than most equivalent standard-depth fridges, so if you don't need that built-in look and/or would like to save money, check out our discussions of French-door refrigerators, bottom-freezer refrigerators, top-freezer refrigerators and side by side refrigerators elsewhere in this report. Rising to the top in this category is the 22.5 cubic foot. Samsung RF23J9011SR (Est. $3,330), a four-door French-door refrigerator. One big downside of most counter-depth refrigerators is that there is less usable space and the available space isn't very versatile, but that's not a problem here because you have option to use the bottom right compartment as either a refrigerator or freezer, depending upon your fresh food needs. It also offers three different settings for, say, soft ice cream or for use as a wine cooler. Writing for the Yale Appliance blog, Steve Sheinkopf praises the RF23J9011SR's flexibility, calling the refrigerator "cool and practical." The Samsung RF23J9011SR is also a top performer in professional tests. Matthew Zahnzinger at Reviewed is highly complimentary of all aspects of performance, but particularly calls out the crispers, which he says do "an excellent job retaining moisture." In fact, he found nothing not to like about the RF23J9011SR, saying it was even an energy efficient choice. He concludes, "In short, with this fridge, you just can't lose." Consumer Reports, concurs, giving it an Excellent for thermostat control, temperature uniformity and noise. And, speaking of noise, the only real complaint we saw about the Samsung RF23J9011SR was that it makes an odd "gurgling" or "bubbling" noise when the compressor comes on. A couple of owners called Samsung, thinking that something might be wrong; there wasn't, that's just the noise it makes. Otherwise, owners give the Samsung RF23J9011SR some of the highest ratings we saw, praising its beautiful design and upscale, LED lighting. Overall, if you have the cash, reviewers say this is the best looking, best performing counter depth, French-door refrigerator around and you won't be sorry you chose it. The Samsung RF23J9011SR is stainless steel, it's also available in black stainless as the Samsung RF23J9011SG (Est. $3,445). 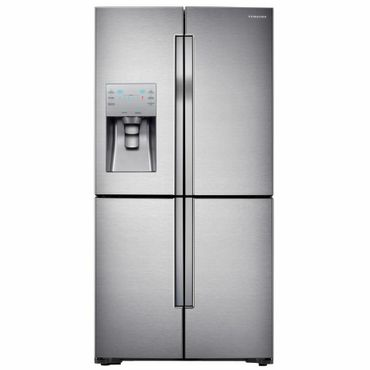 The Samsung RF23J9011SR is the most basic model in Samsung's RF23J/22K series of counter-depth refrigerators. It's a "really good straightforward fridge," says Zahnzinger, but he also gives kudos to the upgraded models in that series, including the 22.1 cubic foot Samsung RF22K9381SR (Est. $3,665). The RF22K9381SR has all of the features of the RF23J9011SR plus Samsung's very popular Food Showcase door-within-a-door design. That allows you to open a glass front on the main refrigerator door to access items stored in the door, without heating up the entire fridge. Consumer Reports also likes the Samsung RF22K9381SR, making it one of their top recommendations for counter-depth refrigerators, with Excellent scores for both thermostat control and temperature uniformity. Owners are equally pleased, although there are fewer reviews than for the more basic Samsung, ratings are well above average. Most praise the appearance, of course (it's a beautiful fridge) and say they love the many options -- especially those who eat more fresh than frozen food and appreciate the option to use part of the freezer as a fridge. The RF22K9381SR is stainless, it also comes in black stainless as the Samsung RF22K9381SG (Est. $3,775). If you would like to spend less for a counter-depth refrigerator, we suggest taking a look at the LG LFC21776ST (Est. $2,200). It hasn't undergone any professional testing, but Steve Sheinkopf includes it in his list of the best counter-depth refrigerators, saying that, "LG's Smart Cooling system and Linear Compressor helps to keep food fresher, longer." Owners like the LG LFC21776ST quite a bit, too. It gets above average ratings in hundreds of reviews, with most saying that it has a very convenient, yet flexible, layout that makes it seem roomier than other counter-depth refrigerators. They also praise its styling, saying it looks built-in. The LFC21776ST is a 20.9 cubic foot, three-door, French-door refrigerator, has a decent array of features, including plenty of in-door storage on both doors. There are two large crisper bins and a smaller one in between the two. Below the crispers is a full length drawer that users love for items like deli trays. Most of the shelves and drawers are adjustable. An ice maker is included, but there is no through the door dispenser -- which some owners consider a plus. The LFC21776ST is stainless steel, but it also comes in black stainless as the LG LFC21776D (Est. $2,200).